Whenever I sat fingers on the keyboard ready to communicate to the blogger world, of late, a voice had been pinging me saying I was receiving only selective readership. Recently, when the voice became a nuisance, I stopped and put up my hands. The foolish ping thought I gave up. Little did it know that’s the power pose. With my arms outstretched I let an extra dose of testosterone rush in to force my inhabitants into a trial settlement. Mind – the plaintiff and Heart – the defendant were ready for the experiment I suggested. The headlines to my writings will be decided by the mind and the rest by the heart. So I began pouring out sonnets and verse and gave it sultry, steamy, oola la, headlines. Readers lol’ed over. Compromise is the name of the game. Ah! it’s just me that’s affected. Today, when her classmates have progressed into medical and other higher institutions, she’s yet to clear her Physics paper. Compromise is the name of the game. Ah! It’s only a child’s future that’s screwed up. My cousin, who was in a relationship with a guy, was forced into an arranged marriage. She agreed after her mom popped sleeping pills by the dozen. Six years and two children later, she’s been treated for chronic depression. Compromise is the name of the game. Ah! It’s only a family that’s ruined. 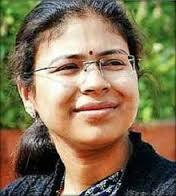 When Durga Shakti Nagpal, the fledgling IAS officer, hauled up trucks she was abiding by the laws that she learnt. Either she is too naïve or too righteous to look for ways out. And Akilesh Yadav is doing his duty by the rules of the book that he has grown up on. Either he is too frightened of his dad or too intoxicated by his power to look for ways out. IAS associations, who ought to stand by the young lady officer, choose to stare ahead, ignoring her like a plague. Compromise, they know, is the only name of the game. But, this affects not only the morale of thousands of aspiring youngsters who believe in the prestigious services but the entire nation who now feels like a pack of worms that can be squashed by politicians.